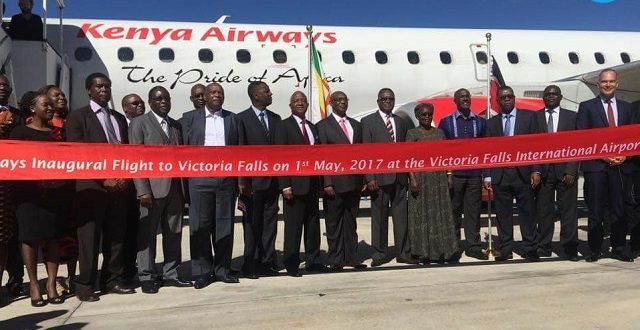 A Kenya Airways plane yesterday landed at the upgraded Victoria Falls International Airport, becoming the second major African airline to fly direct into the resort town in two months. The new-look facility welcomed Ethiopian Airways late March and a new South African Airways wide bodied 222-seater airbus, as it continues to attract the attention of the aviation world. There was ululation, dance and song as the fully booked Embraer E190 landed just after 9.30am before it left for Cape Town an hour later to complete its route. It was welcomed by a water cannon salute, song and dance as well as a toast and cutting of the ribbon. The airliner, popularly known as KQ, will operate three times a week between Nairobi, Victoria Falls and Cape Town in South Africa. Speaking at a colourful ceremony at the airport, Transport and Infrastructural Development Minister Dr Joram Gumbo said the development will go a long way in boosting confidence in the country. “Today’s flight is testimony of route network expansion by Kenya Airways with the addition of three direct flights. The development confirms that Zimbabwe is a safe destination for investment and tourism in line with Zim-Asset as well as ensure increased connectivity for tourists and promote travel to Victoria Falls and Zimbabwe in general,” he said. Dr Gumbo reiterated Government’s continued support for the aviation industry, which is a key enabler in the economy. He said the Government welcomed Kenya Airways with both hands due to its strategic importance to national development through facilitating trade, tourism and regional integration. The airline is the first to fly direct between tourist resorts in Southern Africa, which are Kenya, Victoria Falls and Cape Town. Dr Gumbo said the aviation sector was a key enabler to economic development, which makes it crucial, buttressing Africa Agenda 2063 for enhanced inter-Africa trade and tourism. Kenya Airways group chief executive officer Mr Mbuvi Ngunze said the launch of the route was a milestone to the growth of the civil aviation industry. “This game changing airport needs a commensurate partner and that’s in the form of Kenya Airways. This is a milestone for aviation of both countries as it will play a transformative role in tourism development,” he said. Mr Ngunze said the airline had enjoyed an increased movement of cargo and passengers since it started serving the Zimbabwean route in the 1990s. He said the airline was committed to helping the country increase the number of tourists. Kenyan Ambassador to Zimbabwe Lucy Chelimo and Zimbabwe’s top envoy to her country, Mr Kelbert Nkomani said the coming in of the airline was a gesture of cooperation that exists between the two countries. In attendance were Transport and Infrastructural Development Deputy Minister Michael Madanha, Permanent Secretary Munesu Munodawafa, Civil Aviation Authority of Zimbabwe board chairman Advocate Thembinkosi Magwaliba, Victoria Falls Mayor Sifiso Mpofu, Zimbabwe Tourism Authority management, heads of government departments and tourism players.